Mar. 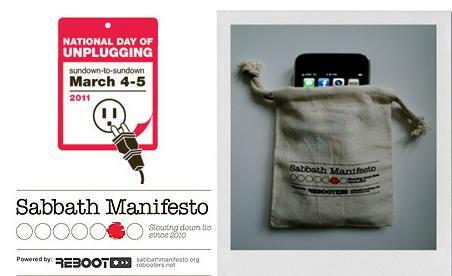 6, 2014 This year the sundown to sundown National Day of Unplugging is Friday March 7, 2014 through Sat. Mar. 8. Join me? For more digital detox beyond media management and awareness raising, (which is a regular ritual for me) please check out the upcoming Screen Free Week challenge May 5-11, 2014. Definitely “not for beginners”…but always very worthwhile. Original National Day of Unplugging Post: Mar 4, 2011 “Retreat, relax, restore” was a tagline I wrote for Sonoma Mission Inn & Spa once upon a time in my ad agency days, and starting today, I’m ditchin’ the digital deluge to do just that for the second annual “National Day of Unplugging” (great video after the jump). Brilliant way to remind people to “reboot” their lives from tech toys and ‘always on’ access (see my lengthy list of info overload coping tips as well as pertinent research from IORG, an entire site and forum devoted to studying the digital deluge). Feel that exhale? That’s what comes when you unplug devices and reconnect with humanity and the outdoors for a full tilt experiential, face to face experience of being “present in the present” away from the high rev of the 21st century rat-race. Personally? A day’s not enough here. I’m going dark a full week, not just because I feel the brain drain of distracted living and partial attention deficits moving me off the mark of my mission, but also because I’m ramping up for April, which is my ‘spring break sanctuary digital detox with teens AND a prequel to my ramp up for the massive Screen Free Week tradition April 18-24, 2011 now in the hosting hands of our friends at CCFC. I like the fact that they keep it simple in ‘slow down’ mode, without a bunch of hoops to jump through so that it’s open to interpretation and not holier than thou and inaccessible. I also find it sublime that they use technology to shut down technology (the Smartphone app enables people to announce their departure from the grid so to speak, by texting REBOOT to 738674) much like we use media to deconstruct media. Kindred spirits indeed! For those who want to take it a step further, or make it a regular ritual, Sabbath Manifesto is also launching “Unplug & Give Back” a national partnership with Volunteermatch.org that enables people to engage in “principle #10” “Give Back.” Just zap your zip code into the Volunteermatch site and out pops a public service opp in your own community. But, er…uh…don’t do that during the National DAY of Unplugging March 4 & 5! Congrats, Sabbath Manifesto crew for a successful press blitz in these major media sources already! San Jose Mercury News – Religion on your iPhone? Psychology Today – Fasting, Gorging or a Balanced Digital Diet? Meanwhile, I’m eager to be on my way for my own unplugged WEEK as I gather thoughts and work on the expansion of my own organization and time management challenges. Also, here’s a promo reminder to PREP FOR SCREEN FREE WEEK NOW as April 18-24 will be here before you know it. I’ll be writing a full post about CCFC’s plans when I return. How Info Overloaded ARE You? (Take Beth Kanter’s Quiz) See Yourself? Xerox Corporation’s Information Overload site – insights, resources and articles. My hubby worked in a Telco. Last Sunday he destroyed 2373 magnetic tapes. They used 1543 pitabyte of digital storage. They do not how to destroy 323 old computers. My computer has 37 ebook which I am yet to read. Internet has taken some basic delights of our life.